A transgender woman who has repeatedly skipped bail while awaiting trial for allegedly robbing a man in Boystown is back in custody after she attacked a CTA canine officer, according to police and court records. Kenneth Manning, 21, has been repeatedly freed from jail by the Chicago Community Bond Fund (CCBF), a charity that works to eliminate cash bail and to post bond for individuals who say they cannot afford to post themselves. In the case of Manning, we reported last month, the CCBF has repeatedly posted bail for Manning despite her repeated failures to show up in court and comply with the terms of her release. Most recently, Manning had been in the wind since she skipped court on Sept. 20th. A warrant was issued for her arrest. Then, shortly after 7 a.m. on Oct. 25th, a CTA canine security contractor approached Manning on a train at the Howard Red Line station. Manning would have to exit the train because she had reached the end of the line, the guard said. Manning attacked the guard, splitting the man's lip, biting his right hand, and causing a laceration to the victim's face, according to police. The 30-year-old guard detained Manning for police. Police say Manning identified herself to officers as Daniel Moore, a man, who had never been arrested before, according to court records. Fingerprint records revealed her true identity. Manning later pleaded guilty to battering the CTA guard and was sentenced to 18 days in jail and one year of court supervision by Judge Anthony Calabrese. Separately, Judge Peggy Chiampas ordered Manning held without bail on the pending Boystown robbery charge. Manning is due back in court on December 20th. 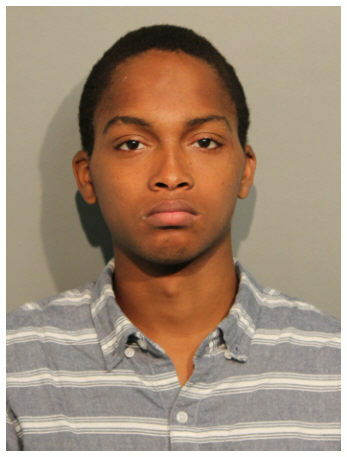 In May 2017, Manning and an accomplice were charged with robbery, aggravated battery, and unlawful restraint for allegedly mugging a man on the Boystown bar strip. The 25-year-old victim told police that he was walking along Halsted when Manning and her accomplice pushed him into an alley and robbed him, prosecutors said. A judge freed Manning on electronic monitoring two days later. About two months later, the CCBF posted a $5,000 bond to get Manning freed from electronic monitoring. Five days later, Manning skipped court and went AWOL for the first time. An arrest warrant was issued. At that point, the bond fund could have been ordered to forfeit Manning’s full $50,000 due to her failure to appear. But Manning showed up in a court a few days later and the judge vacated the bond forfeiture. He also allowed Manning to go free again on the original $5,000 deposit. Three weeks later, Manning again failed to show up in court and she went AWOL again. Another arrest warrant was issued. When Manning remained missing a month later, the judge ordered CCBF to forfeit Manning’s full $50,000 bail. Manning remained missing for months until Cook County Sheriff’s deputies rounded her up on January 5th. But the bond fund wasn’t done doing good deeds for Kenneth Manning. On March 20th, the fund went before Manning’s judge with a stack of letters from social service agencies that virtually begged him to rerelease Manning. The CCBF pleaded to get their $50,000 back. If allowed to post bond, Manning would live at a women’s halfway home for the duration of the case, Manning's lawyer promised. Staff members of the Broadway Youth Center, former staff members of the Center on Halsted, a counselor at Youth Empowerment Performance Project, and others wrote letters of support for Manning. “I believe in Kenneth completely,” one supporter wrote. “She is a responsible, intelligent student…welcome back in our GED program at any time,” said another. A third offered to remind Manning of court dates and provide her with transportation. A fourth person also promised to remind Manning of her court dates and to provide transportation for court “were she be able to bail out” again. Given the community outpouring, Judge William Hooks vacated his $50,000 bond forfeiture order and again released Manning on the original $5,000 that the CCBF put down. Almost exactly three months later, on June 20th, Manning missed her court date. She had an excuse this time: She had been arrested a couple of days earlier and charged with stealing hair extensions in Uptown. The charges were later dropped. On July 25th, Manning was arrested on a warrant. She was freed again. On August 27th, she was arrested for criminal damage to property on the far South Side and was released on a recognizance bond. Then, on September 20th, she failed to show up in court again. She went AWOL until she was arrested at the Howard terminal. Judge Stanley Hooks has again ordered the bond fund to lose its full $50,000 commitment. There's no word about what happened to the promises that Manning would be living in a halfway house or the multiple promises of providing court reminders and transportation to court. We may hear about those things the next time the bond fund asks for its money back.